A Liberal Moment: Timothy Egan Op-Ed Piece! “I told a friend the other day while trying to fathom the election results, that pot is legal in my state, gays are free to marry, and a black man who vowed to raise taxes on the rich won a majority of the popular vote for president, back to back — the first time anyone has done that since Franklin Roosevelt’s second election in 1936. I agree but President Obama must show that leadership. In addition, liberals need to stand up and be proud of what they believe in and not be cowered by “the shills” of Fox News and Rupert Murdoch. “For at least a generation’s time, liberals in this country have been afraid to call themselves liberal. Was it the excesses of their creed, from race-based preferential programs that went on far too long to crude speech censorship by the politically correct and humorless (one and the same) that soiled the brand? In blindly embracing, say, the teachers’ union in the face of overwhelming evidence that public education needs a jolt or in never questioning the efficacy of government programs, the left earned its years in exile. Be Liberal – Be Proud! Petition for a Moratorium on CUNY’s Pathways Curriculum! The PSC and the University Faculty Senate are launching a petition for a moratorium on CUNY’S Pathways Curriculum. Below is a letter from PSC President Barbara Bowen, and University Faculty Senate Chair, Terence Martell, explaining the need for the petition at this time. I urge all members of our community to support this important cause and to sign the petition. This is a watershed moment for higher education. The “reform” agenda that brought relentless testing and widespread privatization to K-12 schools has surfaced in higher education. Forty years of public policy focused on access to college is being replaced by a single-minded demand for increased graduation rates—whatever the cost in academic quality. The battle for educational quality is being fought hard by faculty and staff at The City University of New York (CUNY), long a focal point in struggles for educational justice. CUNY’s educational mission is under attack. Chancellor Matthew Goldstein and the CUNY Board of Trustees, led by Benno Schmidt, Jr., are trying to impose a diluted system of general education, “Pathways,” that seeks to save money at the expense of students’ learning. Facing intense faculty resistance, the CUNY administration has resorted to threats and intimidation. Under the pretext of easing student transfer and increasing graduation rates, Pathways will deliver a minimal curriculum for CUNY’s working-class students: it removes science lab requirements, limits foreign language requirements, and cuts back on faculty time with students in English classes. Pathways is an attempt to move students through the system more quickly even as budgets are cut—by reducing academic requirements. Pathways is austerity education for an austerity economy. With your help, we can defeat Pathways and achieve a victory for educational quality that could have national implications. Please add your voice to ours and take a stand for the integrity of higher education. Latest Data: Less than One-Third of NYC Public School Graduates Are Ready for College! “The school report card grades released Monday prove just how catastrophically New York’s public schools have been failing their students. The city’s entire education establishment — teachers and principals alike — has fallen inexcusably down on the job. Only 29% of high school seniors who graduate in four years come out of the school system prepared for college-level work. That’s less than one-third of the 80,000 or so graduates a year who rely on the public schools for their educations. Beyond shameful, the results border on criminal. Only in the last few years have top education officials come clean on the damning fact that the schools have been lying to students. They always said a Regents diploma certified that a young person was well educated . It wasn’t true. The vast majority of graduates who went on to higher education discovered that they were completely ill-prepared. By the tens of thousands, they required remedial schooling in English, math and other subjects to do college work. Under Mayor Bloomberg, the high school graduation rate climbed from 46% in 2005 to 65% in 2011. The number of teenagers scoring Regents diplomas rose by 5,000 from 2011 to 2012 alone. This bottom line is that the NYC public schools under the current administration simply passed students through the system without providing them the education. Competing with For-Profits to Attract Adult Students! A few weeks ago I was asked to write a brief article on how public and private universities can compete with the for-profits for adult students. The article is now available online at the The EvoLLLution! Now website. Those of you interested in adult learners may fine it interesting. Evolllution Now is a grassroots online newspaper exclusively for, and by, those who are interested in higher education. “The Truth”: Controversial Painting of President Obama! A painting entitled The Truth by Michael D’Antuono features President Obama with a crown of thorns on his head, in a position that is reminiscent of the crucifixion. Currently on display at Boston’s Bunker Hill Community College Art Gallery as part of D’Antuono’s politically charged “Artists on the Stump – the Road to the White House 2012″ collection, the piece was actually supposed to debut several years ago here in New York City’s Union Square. Because of opposition from religious groups especially the Christian Right, D’Antuono cancelled its showing then. 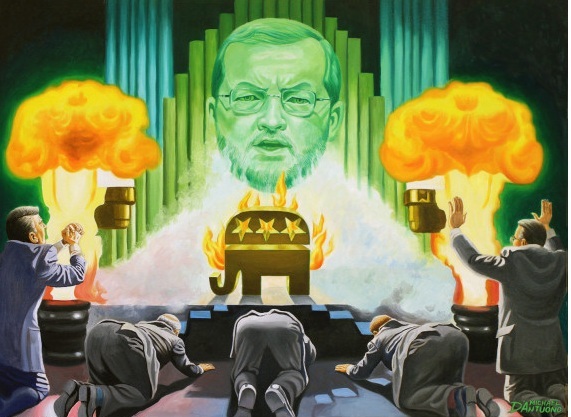 Another painting (see below) entitled Who the Hell is Grover Norquist, by D’Antuono at the exhibiton in Boston, depicts Grover Norquist as a mean-spirited Wizard of Oz with Washington Republican politicians kneeling before him. Warren Buffett: A Minimum Tax for the Wealthy! “The Forbes 400, the wealthiest individuals in America, hit a new group record for wealth this year: $1.7 trillion. That’s more than five times the $300 billion total in 1992. In recent years, my gang has been leaving the middle class in the dust. Thank you, Mr. Buffett,for your sage advice. Now we just need to get Washington, especially the Republican-controlled House, to listen. Is There a Manufacturing Skills Gap, a Wages Gap or an Education Gap? Adam Davidson, founder of NPR’s Planet Money, had an essay in yesterday’s New York Times Magazine, examining the issues related to job skills and manufacturing. He introduced the topic by referring to his observation of a class in the engineering technology program at Queensborough Community College taught by Professor Joseph Goldenrod. Much for all of us but especially young people to think about. All Middle Schools Not Created Equal in NYC! In some of these schools the percentages of minority students are dismal. “Richard Hyndes’ 7-year-old daughter just transferred into the second grade at the school. 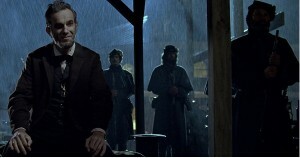 Take in a Movie this Holiday Weekend: Try “Lincoln”! If you are not away visiting family or exhausted shopping and taking advantage of Black Friday sales, you might want to go to the movies this holiday weekend. Last night I saw Lincoln, the movie based on a book by Doris Kearns Goodwin, directed by Steven Spielberg and starring Daniel Day-Lewis. Lincoln centers entirely on the political battle between Abraham Lincoln (a Republican) and the Democrats over the passage of the 13th Amendment that would end slavery in this country. Set in the closing months of the Civil War, I found myself riveted as the political intrigue unfurls and historic figures such as Mary Todd Lincoln and Thaddeus Stevens come to life. It also reminded me of the stark differences in the social positions of the two political parties in the 1860s versus today. For example, Fernando Wood, a former mayor and a Congressman from New York City is one of the leaders in the Democratic Party’s opposition to the Republican amendment. As the New York Times review stated: “Lincoln may be among the finest films ever made about American politics”. 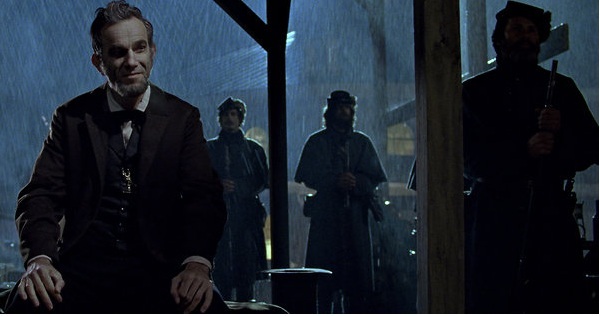 I also enjoyed the layers of Abraham Lincoln exposed in the film. We see Lincoln the husband, the father, the story teller (the one about George Washington in a British privy had the audience howling), the statesman, and the wheeler-dealer politician. Even though we all know the outcome, it is still a fine piece of entertainment filled with history, democracy in action and of course, Abraham Lincoln. Students at One Bronx School Cannot Take Math or English: Just the Tip of the Iceberg! “…the school claims it simply doesn’t have enough teachers to offer the students those basic classes this semester, but that the students will eventually earn enough credits to graduate, several people said. …Megan Hester, collaborative coordinator at the Annenberg Institute for School Reform, said the school may have been forced to make a “devil’s bargain” between funding the honors program and providing those basic courses every semester. She noted that an Annenberg analysis shows that only 1 in 10 high school graduates in the Claremont neighborhood where Medical Science is located meet the state’s college-readiness benchmarks. This is sad but only the tip of the iceberg at many small high schools in the poorer areas of New York City. Budget and the availability of certified teachers in certain subject areas such as mathematics and science is a long-standing problem that has never been adequately resolved. In addition, many of the new small schools built or remodeled in the past decade lack access to any labs to teach chemistry or biology. Because of cost and other building code issues, dozens of small high schools do not have laboratories and cannot offer any lab-based courses thereby dooming their students to high school careers devoid of genuine science instruction. With all of the emphasis in the past several years on the importance of STEM courses for careers and employment, it is a travesty that by design, the City has betrayed many of its students by placing them in lab-less schools.